Evander Kane celebrates his shootout winner for Winnipeg. His hit on Ryan McDonagh separated the Ranger captain’s left shoulder. Injuries are part of sports. Last year, the Rangers got lucky. Being healthy allowed them to make a run to the Stanley Cup Final. Even with Ryan McDonagh recovering from a cheap hit from Alex Burrows that cost him the last five of the regular season. The Rangers’ 27th captain rounded into form and was instrumental last Spring. Now, he’ll be out at least a month after suffering a separated left shoulder during Saturday’s 1-0 shootout loss to Winnipeg at MSG. McDonagh took a clean Evander Kane check with his shoulder exposed into the glass. As soon as it happened, I knew it was bad. Helped off the ice, he was clearly in pain. Complicating matters, Kevin Klein left the contest after blocking a Jacob Trouba shot. He sustained a contusion. That forced Alain Vigneault to play Dan Girardi nearly 35 minutes. Taking 37 shifts, he logged a jaw dropping 34:50 finishing with seven blocked shots. Marc Staal was equally impressive getting 36 shifts (29:33) playing one of his best games in a couple of years. Even Michael Kostka excelled in 21:56 while teamed with Staal. Matt Hunwick continued to provide a boost logging 27:58. Give Glen Sather credit for signing him. The big concern is how will they survive without McDonagh. Already down Dan Boyle and the suspended John Moore, the Rangers are faced with a tall order. Assuming Klein can’t go tomorrow against St. Louis, that means they’ll only have two of their starting six D. A crazy thought as the schedule picks up with Detroit also in town Wednesday. The good news is they’ll mostly be home for the first part of November with only the traditional road game at Toronto next Saturday for Hall Of Fame weekend. Edmonton, Colorado and Pittsburgh also visit following that game. Indeed, the minutes he logs will go to Girardi and Staal. However, if last night is any indication they won’t be paired together. Vigneault wisely split them up and got good results as noted above. It’s smart to have a lefty and righty paired up. If Hunwick-Girardi and Staal-Kostka are their first two tandems, then what exactly is the third? We could see Conor Allen and Mat Bodie, who might be more ready than former first round pick Dylan McIlrath. As we know, Vigneault prefers skill over toughness which explains why his team got battered by Winnipeg. Especially Kane and Dustin Byfuglien with each delivering thunderous checks. At this rate, I don’t see how they can survive the season. At some point, you need someone who won’t tolerate it. The Rangers are a small team that can be pushed around. When you have only Staal responding to Kane’s hit that injured McDonagh, that’s alarming. Equally as troublesome is the power play. They fired blanks in five chances and are now 2-for-28. Through 10 games, they rank 28th at a measly 7.1 percent. Both power play goals came in a comeback win at New Jersey. Outside of some early opportunities, they were dismal. Granted. They’re still missing Boyle and Derek Stepan. But at some point, something has to give. When exactly does assistant coach Scott Arniel receive criticism? This has been going on for a while. The same miserable power play might’ve cost them the Cup. That and their inability to protect third period leads doomed them. Tanner Glass battles Mark Stuart during last night’s Rangers loss to Winnipeg. Most frustrating is they couldn’t solve Pavelec, who to his credit played a second consecutive good game. If not for a blown defensive assignment, he would’ve gone 3-0 against the Islanders, Devils and Rangers. He was at his best throughout stoning Ranger shooters at every turn. That included an all out assault in a dominant second period that saw them outshoot the Jets 16-8. They had plenty of chances but couldn’t bury any. Kevin Hayes had one of the best after intercepting a pass and breaking in on Pavelec but deked once too many. The 23-year old just can’t finish but does everything else well. At the opposite end, Lundqvist was equally as good. He wasn’t as busy but as the D tired, he stepped it up. Jets shooters targeted high glove but were turned away. Particularly Byfuglien and Zach Bogosian. They weren’t able to beat him during the first 65 minutes but solved him twice in the shootout. Both Blake Wheeler and Kane beat him with wicked wrist shots. Following Mats Zuccarello freezing Pavelec for a fancy forehand tuck, Wheeler blew one past Lundqvist to even it after Round 1. 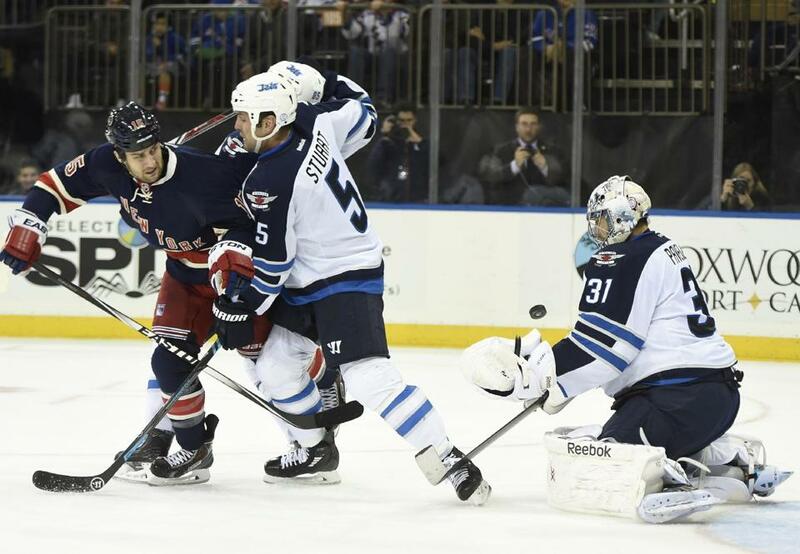 Rick Nash, Dominic Moore and Marty St. Louis were turned away by Pavelec. Lundqvist denied Andrew Ladd and Bryan Little before allowing Kane’s decider in Round 4. The overtime was exciting with Pavelec stoning Chris Kreider and St. Louis on breakaways. It was a frustrating night. A game where the Blueshirts played exceptionally well given the circumstances, they couldn’t score. You can’t fault the effort. But the lack of finish is disappointing. After 10 games, St. Louis and Zuccarello each have 1 goal while Kreider has 2. Not enough production from three of their four top wings. Only Nash has performed netting 9. Without him, where would they be? Complicating matters, Carl Hagelin has 2 and Vigneault refused to give Anthony Duclair one shift during 4-on-4 in OT. Ridiculous. He preferred to play Moore and even used him in the skill competition. Basically, Vigneault played for the shootout and got what he deserved. There’s no reason Duclair shouldn’t have seen the ice. Aside from a minor penalty, he made things happen in 17 shifts (10:43). So did Hayes, who only saw 9:16. At what point does the coaching staff trust our young players enough to play them more minutes? Unless Kreider wakes up along with St. Louis and Zuccarello, there isn’t enough scoring. Once Stepan is activated, that will help. It will allow St. Louis to shift to the right side instead of playing out of position. Derick Brassard and Zuccarello won’t be asked to see top defensemen. That’ll go to Stepan and probably St. Louis. Personally, I’d like to see Nash stay with Brassard and Zuccarello while Kreider plays with Stepan and Zuccarello. I would also be happy if Vigneault tried a third line of Hagelin, Hayes and Duclair. Lee Stempniak has cooled off and can go down to the fourth line with Moore and Tanner Glass. What happens with Chris Mueller, who’s been strong on faceoffs? He went 8-and-2 last night and looks to have secured a spot over Ryan Malone, who was put on waivers. 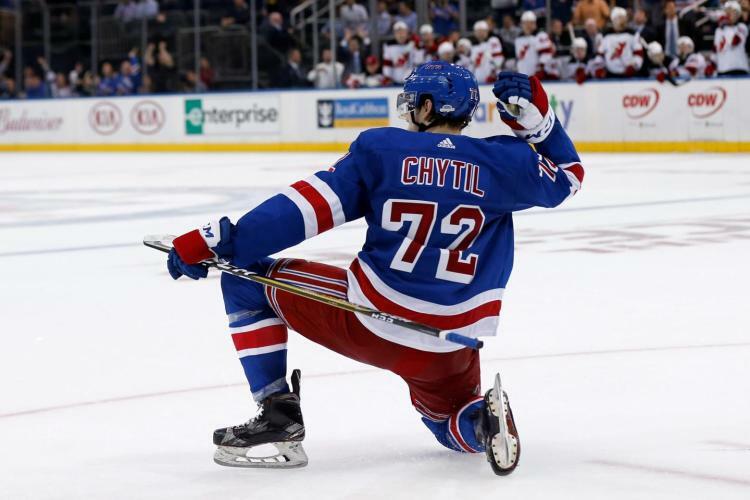 This entry was posted in Battle News, NYRangers and tagged Andrew Ladd, Anthony Duclair, Blake Wheeler, Carl Hagelin, Chris Kreider, Conor Allen, Dan Boyle, Dan Girardi, Derek Stepan, Derick Brassard, Dustin Byfuglien, Dylan McIlrath, Evander Kane, Henrik Lundqvist, Jacob Trouba, Kevin Hayes, Kevin Klein, Lee Stempniak, Marc Staal, Mat Bodie, Mats Zuccarello, Matt Hunwick, Michael Kostka, NY Rangers, Ondrej Pavelec, Rick Nash, Ryan McDonagh, Winnipeg Jets, Zach Bogosian. Bookmark the permalink.